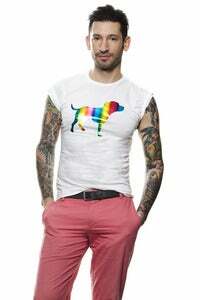 John Bartlett's limited edition "Gay, Proud & Compassionate" shirts have been getting some major press from the LA Times to The Village Voice, The Wild Magazine, and more. 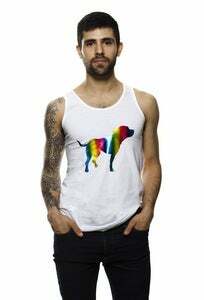 These LIMITED EDITION pieces are available here: http://bit.ly/JBPRIDE and are almost sold out! Each one features the signature "Tiny Tim" Logo in rainbow foil - a throwback to the tees of the late 80's/Early 90's. The tops are not just a fun and colorful way to show your pride this year - but also highlight another part of our strong and powerful community that is often overlooked - our compassion. These tees and tanks were not shot on models, but actual members of our community, like yours truly and my boyfriend James. I'm not only proud to be gay, proud to express my love, and proud to be an individual - but also proud to be compassionate and make a difference in the lives of animals - a class of creatures that we so often overlook. 10% of the proceeds donated directly to The Tiny Tim Rescue Fund.